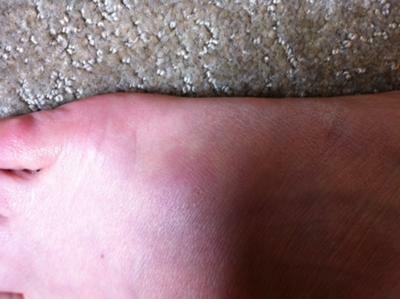 About a week and half ago the tower hard drive under my desk tipped over and hit the top of my right foot. It immediately caused a large welt which I iced right away. The next day the top of my foot became bruised from the toes to the ankle. I applied ice for a few days. Now the bruising is gone but it is very tender, can not touch it without pain and there is a bump. In cases of this type of trauma, I would think that after ten days the foot would be feeling a lot better. Additionally, I know nothing of your overall health which could play a role in the ability of the body to heal the injured area. For example, if you happen to be diabetic, perhaps poor circulation, that could delay the healing. If you happen to be on blood thinners or happen to be obese than that too might come into play as well. These are the more common medical issues that delay healing. Assuming for the moment that you are an otherwise healthy individual then as I said you should be feeling a lot better by now. As I vision the accident, the tower just tipped over and fell on your foot; it did not fall off the top of the desk and land with a real hard impact. So, I think to myself, how much damage could that type of trauma have caused? the mechanism of injury does not seem like it could cause a break in any of the bones in your foot, I have learned after 30 years of practice that crazy things happen. A fracture, even a small chip fracture of the bone would be enough to keep the area painful to touch and certainly would make walking an issue as well. There are other possible sources of this continued pain on top of your foot. Again depending on the way the tower hit your foot, there is also the possibility that you damaged one or more of the tendons that run from your ankle to your toes. The purpose of these tendons is to lift your toes upward. Direct trauma particularly if the corner of the tower hit your foot, rather than the flat side of the tower, could have created enough force to injure the tendons and make it difficult to walk, even after ten days. Additionally, this could also be the source of the swelling as well, an inflamed tendon. Lastly, although probably the least likely cause of your continued pain would be an inflamed vein on the top of your foot. If you look at the top of either foot, you will notice a lot of what is known as superficial veins. These run directly under the skin and and so are very susceptible to trauma. They generally would not hurt as much but could be the source of continued swelling. So as I said earlier, ten days seems to long to be a simple contusion. My suggestion would be to see a foot specialist in your area.